Editable Teacher Binder *** That's mine! Umm..who would not want to win this great list of prizes? I mean, really, this is a great giveaway!! 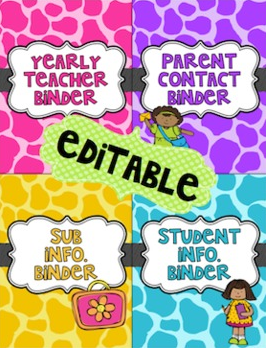 The binder I am giving away is an editable binder, so you can type any information you need into it. You can also adjust charts and tables to make them suit you and your number of students. This is my favorite way to stay organized and every time I need something quickly for a meeting or conference, I can just grab my binder and know that I have everything I need! Wow! I cannot believe there are only 28 days left of school! What!? I have had a great week! I hope you have, too!! My husband and I got new porch furniture! Orange for our Auburn Tigers!! Yay! We looove this furniture! A great World Market purchase! So glad we found them! I am really enjoying sitting out there! Last weekend was the "Last Roll" ...for those of you who are into SEC football, you probably know that us Auburn fans roll the oak trees at Toomer's Corner as tradition when we win sporting events (especially football). Well, a silly 'Bama fan poisoned our trees and thought he would get us down....well, he didn't! There is a reason they call it tradition! It is what we do, and will always be what we do! So this year, at the Spring game, all of the town of Auburn rolled the trees of Toomer's corner for one last time before the dead ones were removed. They will be replacing them and beautifying the corner at the same time :) Hopefully in time for next year's season!? Here is a few photos I took of our corner when we won the National Championship while I lived in Auburn...Isn't it GREAT!? You should really check them out if you have not seem them before! 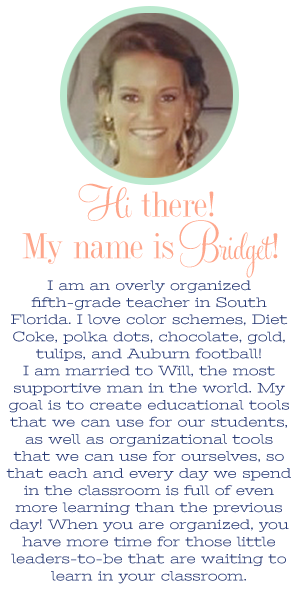 Last...I am taking part in an AMAZING giveaway over at Lessons from the Middle and Create, Teach, and Share! There are SO many products being given away! This is an end-of-the-year themed giveaway! 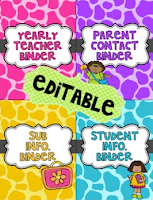 I will be giving away my Editable Teacher Binder! 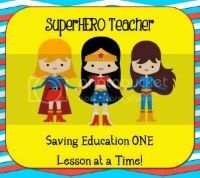 :) I just looove this product and am already looking forward to setting mine up for next year! 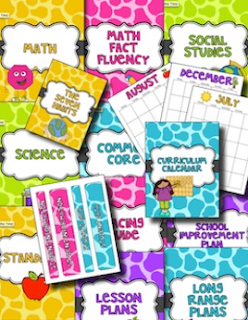 I just love to be organized! It is a great way to start the year! Be sure to check it out!!!!! There are TONS of prizes - including a $35 Amazon gift card!! Go ahead and check out what everyone else is doing this Friday at Doodle Bugs Teaching, it's not hard to stumble upon something great when blog hopping! Phew! This took me longer than I anticipated! I just kept thinking of things to add to the unit! 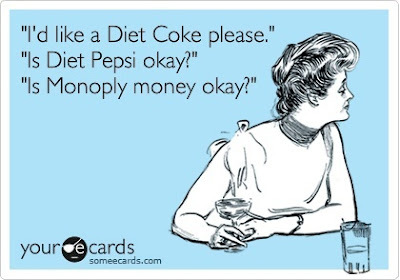 I cannot wait to use this with my students throughout this “test review” time of the year! And finally...the Central Tendencies Unit! This pack includes a poster for each of the central tendencies: mean, median, mode, range, and outlier. 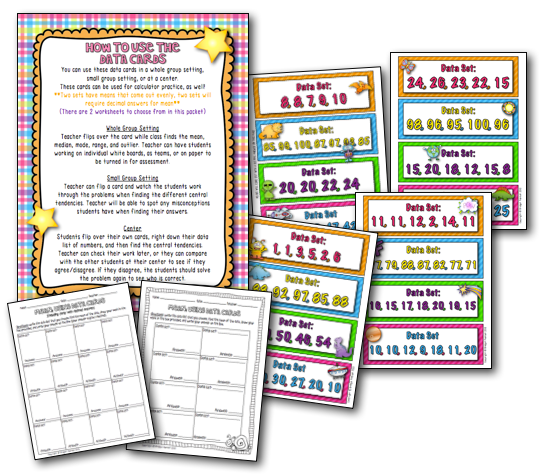 There is also a worksheet for each of them so that you can make sure the students practice the skill. 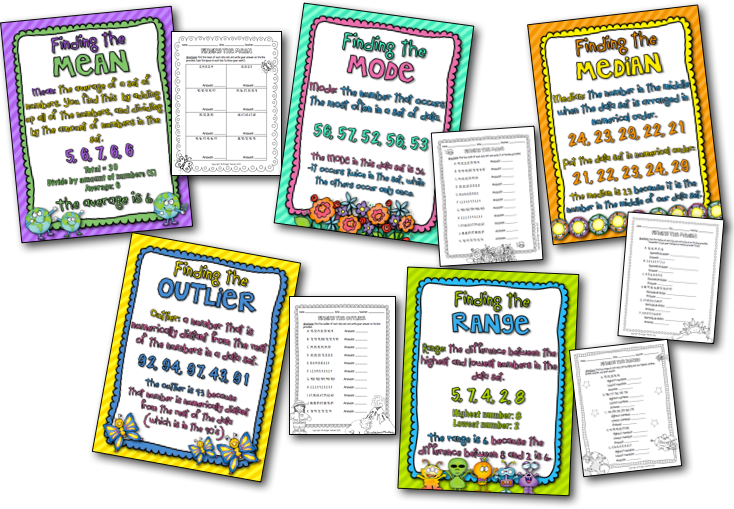 It is really important to master each of the central tendencies before moving on to the rest of the packet, where they are finding mean, median, mode, range, and outlier for each set of data. That is overwhelming unless they feel comfortable with each individual skill. After the students have gotten comfortable with each of the skills separately, you can move on to the fun science-related topics!! There are five different sections in this packet that use a science-related topics (environment, weather, archaeology, outer space, and chemistry). These topics are not used in a ‘teaching science’ kind of way, though. I have used them in a fun and interesting way in order to engage students. 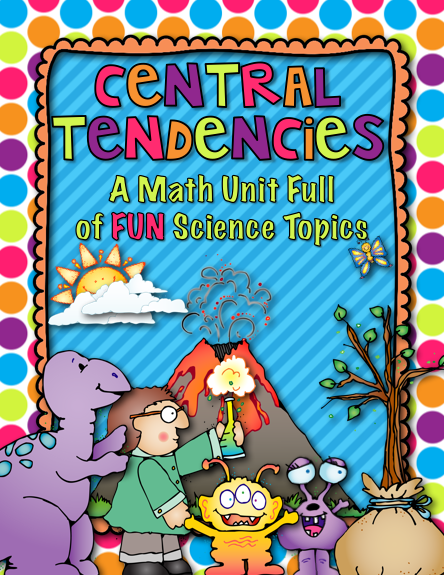 For example, in the chemistry unit, the students will be using data from a recipe to answer central tendency questions. The ‘recipes’ are silly - the recipe for a “sneezer” and a “smiler” - and engaging for the students. 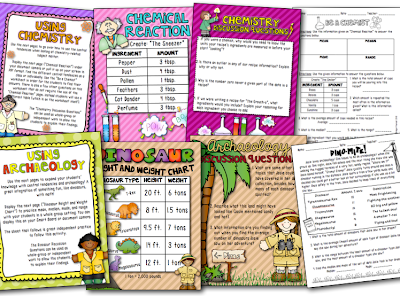 Each science topic includes an introduction page for the teacher, a large chart (to be used whole-group, at a center, or in small group), a worksheet for assessing the students/practicing, and Common Core discussion questions related to central tendencies. 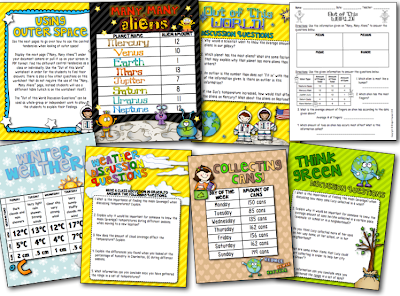 The last section in the packet includes data set cards, with worksheets to match, for student practice. There is a set of data cards that will result in decimal answers for the mean, and a set that will result in whole numbers for the mean. You can choose one or the other, or both! I also use these data cards after testing when we do a lot of calculator practice work. The students need to prepare for middle school and using a calculator is actually a surprisingly difficult skill. 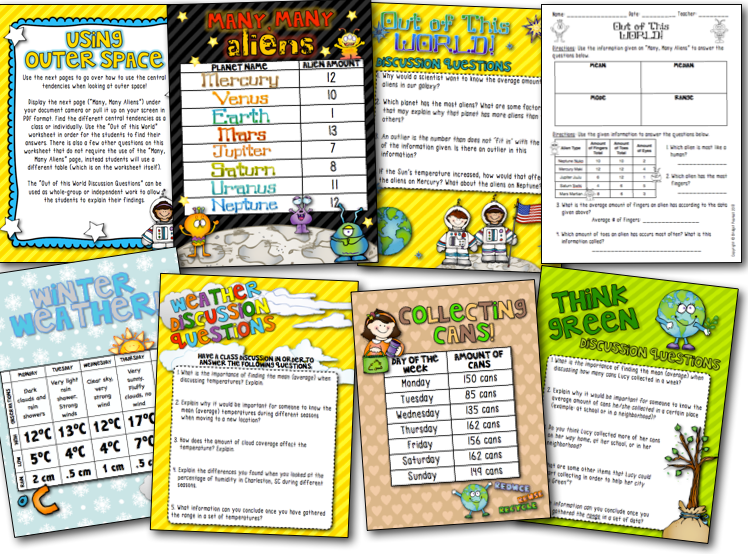 These data cards end up as a great way to reinforce mean and range with calculator practice later in the year! This little CUTIE! My niece, Savanna, is SO perfect! I am so obsessed with her. She will be three months old in a few days and I am crazy in love! I got to spend time babysitting her for two whole days, also! Well..my mom, her nana, was the one doing all of the hard stuff...but I got to love on her and play with her so much! Yay! So presh! Miss her so much already! It was so great to see everyone. Here are our four generations of girls! :) Family is the best! I am so lucky! I had the best week doing this like....shopping, getting a pedicure, working out, going to Maroon 5, eating out, and hanging out with Savanna! Catching up on TiVo, anyone? This is the kind of day I need once a week! The day to catch up on all of those silly shoes I tape throughout the week! Something that makes today even better than the usual TiVo day? Easter candy!!!! 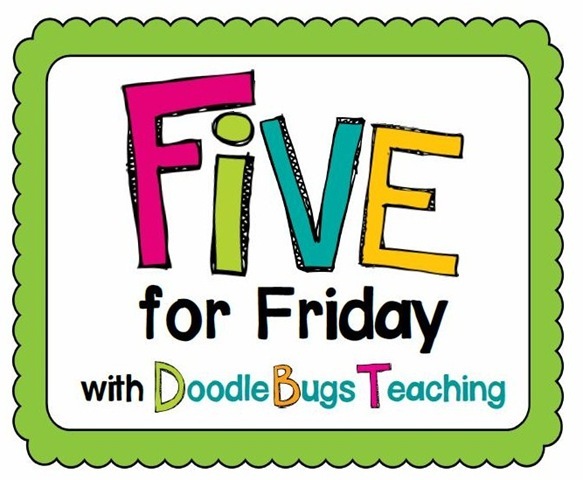 Let's just say...I am hanging with my "peeps"
Check out what everyone else is up to over at the Five for Friday link up!